Some workers were not protected by the Factory Act. Particularly neglected were construction workers and civic employees. In the 19th century, there was no uniform requirement for erecting and maintaining scaffolding. Scaffolding complaints were recorded in Guelph as early as 1876, but no Scaffolding Act enacted until 1911/1912. The instances of scaffolding giving way while workers were using them, are numerous. 1873 - Mr. Shaw, a mason, “pointing” stone at Raymond’s, jumped 18' onto a safe plank, when the scaffolding suddenly gave way. Between 1902 and 1912, at least six accidents involved ladders and planks and three involving scaffolds. Three of these workers were killed. Two had fallen from a scaffold. On October 11, 1906, Graham Duncan, Howard Clark and Morris Wheeler were roofing for D. Young, a contractor, when their scaffold broke. Morris Wheeler’s head was cut open, Howard Clark suffered from an injured spine and Graham Duncan was killed. In 1907, John Stewart was decorating the ceiling of Church of Our Lady, when he fell 12 feet from his scaffold to his death. A benefit concert was held to raise money for his family in December. It was no wonder that unions wanted to see some sort of scaffolding legislation put into place. 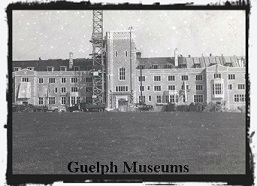 Nevertheless, in spite of the law having been passed in 1911, Guelph was still without a scaffold inspector in 1912. The Guelph Trades and Labour Council (GTLC), after a meeting held in May 1912, intended to ask that an inspector be provided. Their request may have gone unnoticed except for the June 1912 fatality of Robert Little, a bricklayer/stonemason, working on the city jail. At age 45, he met his death when the scaffolding gave way. Yet, it was not until 1913, after an unnamed builder’s labourer fell to his death from faulty scaffold construction, did Guelph inspectors and builders seriously consider the safety of their employees.